In a panic to get the Pier demolition process started, the Kriseman administration quickly canceled security protection for the Pier, and erected a mesh covered used chain link fence across the Pier approach. The net effect is to create something on the water front that looks more like the entrance to a prison than a tourist attraction. With no daytime security, regardless of what the City Legal department says, the Pier is now a safety risk, ripe for vandalism and who knows what else. Elsewhere in social media, saintpetersblog, a City attorney says he doesn't think there is a liability to the City, but that will be a pretty weak explanation if someone's child or a wandering tourist is killed or injured. The Corps of Engineers says it could be fall before all of the pieces are in place for the permits, and while it is quite likely the Corps is getting some political heat, my experience is they don't respond real well to that kind of pressure. Some attempt to protect the public (this fence doesn't qualify) and the image of the Pier and downtown would seem to be a wise plan. 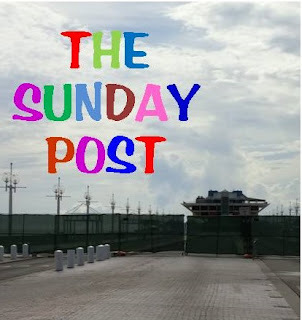 It would only make good sense for the Administration to keep things neat, clean and safe around the Pier approach since a lot of people walk down that way and a fence like that is really tempting to a lot of people. This is yet another short sighted knee jerk reaction by an administration that is so fixated on getting their way and tearing down the Inverted Pyramid that they are exercising no reason in their decision making. Same approach will likely carry right into the design review process. It is also interesting that the City's New Pier Web site has not been updated since July 9, 2015. That's just about the time the demolition Permits thing blew up. So much for transparency and timely updating. The Office of the Mayor – is it worth the money? Who Are the Sales Tax Hike Cheerleaders? St. Petersburg - Where's the Mayor? Is Tampa giving up on roads? Hillsborough PLG: Where is Plan B?